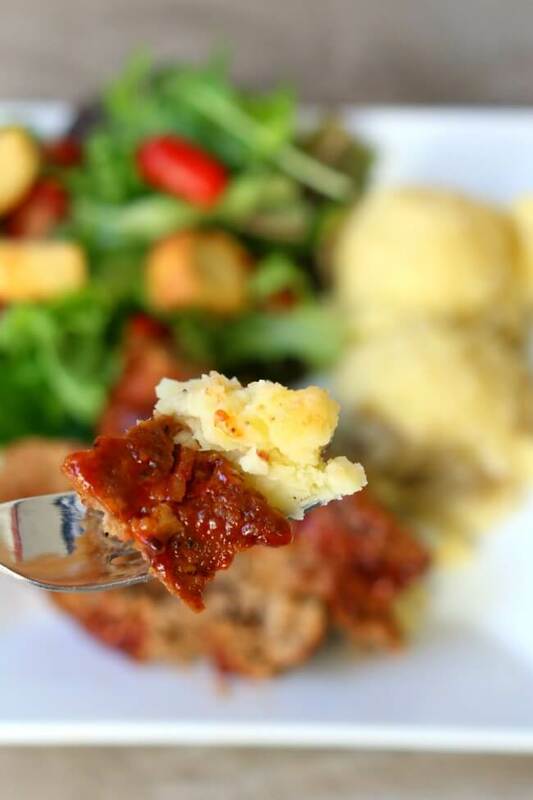 Instant Pot Bacon Barbecue Meatloaf with Mashed Potatoes–the best flavored meatloaf ever is cooked at the same time and in the same pressure cooker as your mashed potatoes. Add a tossed salad and you have a complete meal ready to go in just a few minutes. Usually meatloaf is one of those meals that is pretty neutral for me. I don’t love it and I don’t hate it. Today that is no longer the case. I LOVE meatloaf. More specifically I love this instant pot bacon barbecue meatloaf with mashed potatoes. The flavor was absolutely delicious and my whole family scarfed it down in like 2.2 seconds. We all wished that I had made more! You need to make this recipe this week for dinner. The reasons? It has bacon in it and the bacon gives the meatloaf an amazing flavor. 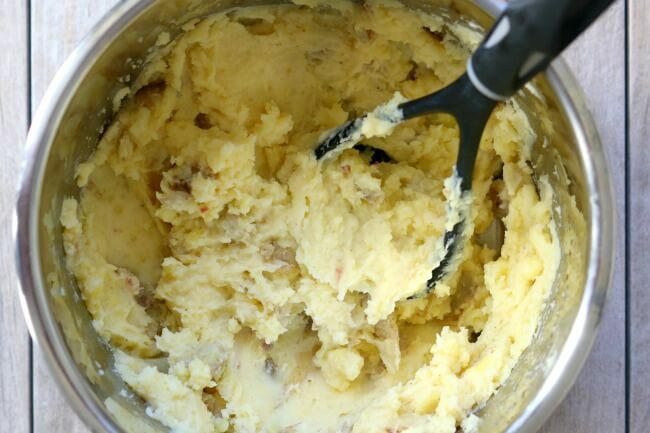 You can make mashed potatoes and meatloaf at the same time, in the same pot, in 20 minutes. The consistency of the meatloaf is perfect. It’s not mushy, it’s not dry. Mashed potatoes are delicious and these garlic mashed potatoes are the only kind I make these days. 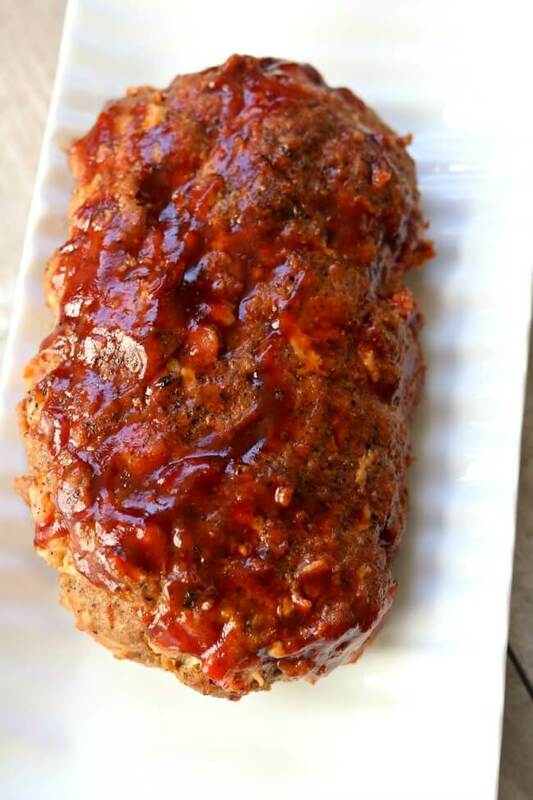 I know you’ll love this meatloaf! Promise. Here is a video of my daughter, Reagan, making this meatloaf. Summer project! For this Instant Pot Bacon Barbecue Meatloaf with Mashed Potatoes recipe I used my 6 quart Instant Pot Duo 60 7 in 1 for this recipe. I also own the 6 quart Instant Pot IP-LUX60 V3 Programmable Electric Pressure Cooker. They are both great pressure cookers! The first one I mentioned has a yogurt making function but other than that they are fairly similar. The price difference between the two is about $20. Thanks for stopping by! 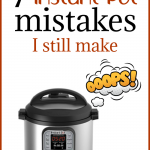 Do you love Instant Pot and crockpot recipes? Wish you had more good ones that your family would actually eat? Get all my new recipes delivered to your email inbox by signing up below. I’ve sung this recipe’s praises before, but after making it again last night just had to do it one more time. I am not a fan of most meatloaves, finding them too bland, too one-note, too just not worth it. Not this one! It’s bursting with flavor, all in perfect balance. It’s the only one for me, I haven’t even looked at another meatloaf since meeting this one. I’d cook it on it’s own (and have), but the kicker that takes it from Great to Genius is cooking the potatoes at the same time. Brilliant! Glad you liked it! Thanks for sharing your experience. Hi my daughter really wants cheese on the meat loaf. What would be the best way to add cheese. You could add some grated cheese into the actual meatloaf and then melt a little on top after it’s done under the oven’s broiler. I’m new to the instant pot. So this recipe is 15 minutes prep and 20 minutes to cook, but this doesn’t include the time needed to reach pressure and depressurize, right? Can I leave this on warm for any amount of time or will it turn into mush? Thanks! Yes you’re right. you need to consider the time it takes to come to pressure and release pressure. It is totally fine to leave on warm. Super easy, and super delicious. One question…..can I cook the meatloaf in something different….maybe a small stainless steel bowl? Not sure how healthy using tinfoil is? Wonder if there is another option? Yes you can. I have done that a few times. I added about 5 minutes extra time. If I’m just cooking the meatloaf without the potatoes, do I still need to put the meatloaf on the rack? Or just put it in the pot without the insert? Really easy to make and family loved the flavors of the meatloaf and potatoes. I did a side of steam green beans instead of a salad. Definitely will make again! This receipe is fantastic!! Like a lot of other folks, I made a bigger meatloaf (added 50% to the recipe and cook time). It came out perfect. It was great to have the potatoes in the same pot and they were phenomenal. 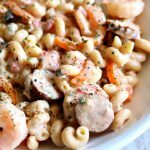 This is the first recipe I’ve tried with my instant pot! It is great! So easy and good! I can’t wait to try some more recipes from your blog! Had to leave a comment because this recipe is amazing!! This was my first ever instapot meal and it was perfection! The mashed potatoes were easily the best I’ve ever had (creamy AF without too much milk/butter and omitted the sour cream only as we didn’t have any) – my husband loved them! There are no leftovers between the 2.5 of us (~2 y/o) and this will 100% be on our regular roster. My husband loooves meatloaf but I usually kaibosh it on weeknights because it’s so time consuming. Now I don’t have to and I know he’s going to love it! no not necessary. It just makes it look a little nicer. I just made this today. My family can’t stop raving about it, like over and over. There are two of them eating and I don’t think there will be an ounce left. I made this with 1 lb of grass fed beef, 3 strips of gluten free bacon because that was all I had on hand, gluten free bread crumbs and the rest just as written. I have the mini 3 qt pot so used two small russet potatoes. The 1 lb of meat fit just fine on the foil flattened out to fit below the fill line. 20 minutes was perfect. I did not use sour cream but whipped the potatoes with butter, milk and heavy whipping cream, they were heavenly. This was my first time to make a real one pot meal. I am super proud of myself so thanks so much for this easy and satisfying recipe. This is a keeper for sure!! BTW Sweet Baby Ray’s is gluten free. This was great! Doubled the meat and doubled the time. Fantastic! Did you double the whole recipe or just the meat? Made this for dinner and it was wonderful! I like my hamburger just a little more done. I would like to cook it a little longer next time but I’m new to the Instant Pot. How much could I increase the cook time without messing up the potatoes? Thanks for the awesome recipe! I bet you could go another 5 minutes without problems. This meat loaf is delicious!! This recipe is awesome! I’ve made it ten+ times already. Everyone loves it, and the kids keep asking me to make it again. Thanks for sharing this recipe!! I made the meat mixture in advance and froze it. After work, I placed the potatoes and frozen meatloaf in the instant pot and it came out perfect. Directly from frozen?? Thats wonderful! Did you cook the frozen meatloaf from frozen, or did you thaw it first? What was the cook time? Thank you! Your daughter did an amazing job- move over Gordon Ramsay! My instant pot doesn’t have a button that says manual? Any idea what I press instead? does it have a pressure cook setting? If I double this recipe in my 8qt. do I need to adjust the cooking time? ? Making this today for our July 4th party so I’ll post how it goes! Did you adjust the cooking time for a double batch? I’d also like to double but wondering how long to cook for. Have made this a bunch and it’s always a hit!! Was wondering what I would have to do if I just wanted to make the mashed potatoes and not the meatloaf how would I have to adjust the settings and time on the IP?? Thanks so much!! 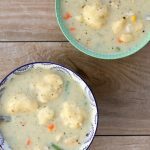 A very solid recipe and so easy with the instant pot. I added 1/4 puréed onion to add more flavor depth. I’ll used it again Thanks! I also only had red potatoes so I left them quartered and melted butter, chopped parsley and thyme on them for tasty side. This was wonderful! When I saw your email the other day, I remembered I had pinned this recipe to try and Father’s Day seemed like the day. This was my first time cooking two separate dishes at the same time in my IP, it worked out great. The potatoes were so creamy, the meatloaf delicious! We all loved it, especially my husband. Ps. Your daughter did a great job in the video, it was very helpful! Glad you liked it Jeni!!! I’ve made this recipe a lot. My whole family loves it. If I double the meat do I need to double the entire ingredients for the actual meatloaf? Yes I would. That way it will still be flavorful! If we are tripling the recipe how does the cook time change? wow! Does it fit in your pot? I would increase the cooking time to 30 minutes. Check internal temp of meatloaf with a thermometer. Haha didn’t think about it fitting, might just double it and do two batches. Thank you for the info! how do I cook it in a crockpot? Does this need to be fresh ground beef or can you thaw frozen ground beef and use this? You could thaw the ground beef. Can you do this in a slow cooker, and if so give me the time to cook on LOW. Thank You. I really need to try to make this in the slow cooker. I will try it out and let you know how it goes! My husband and I loved this! This was very good! and i did use ground turkey. I never had bbq sauce on meatloaf before and it was perfect since my husband is not a fan of ketchup. i also love that i could cook the meatloaf and the potatoes together at the same time! Is there something you can use instead of aluminum foil to hold the meatloaf in the Instant Pot? You can place the meatloaf in an oven safe dish that fits inside your instant pot, like a 7 inch cake pan or a pyrex or corningware dish. I used a foil bread pan. I cut the rim off and it fit perfectly on top of the rack above the potatoes. O yeah, this is a good one! Just made it again last night for the 3rd time. Yum! Only problem -no leftovers ,LOL. I know right? My kids are always wishing for more meatloaf. This was so easy and tasted great! My husband did say it was a little mushy but yasted good. Maybe I’ll cut back on the bbq sauce a little. I did use 1 lb of meat and broiled it. This delicious meatloaf with mashed potatoes turned out perfectly and had a wonderful flavor. I did not have enough barbeque sauce to brush on top, so made a brown sugar glaze and finished it under the broiler for a few minutes. Approximately 1/3 cup ketchup, 1 tbs mustard, and 2 tbs brown sugar, adjust to taste. Karen, this meatloaf is SO good! I’ve been making Ree Dummond’s meatloaf (adapted for the IP by Barbara Schieving) for a while and admit I was worried about adding so much BBQ sauce in the mix, but it wasn’t overpowering at all, it just tasted delicious, better than Ree’s recipe. Lacking the breadcrumbs, I made fresh ones using ½ a burger bun plus some Italian seasoning and it was fine. I may sneak in some grated carrot or zucchini next time, but either way, this is my new go-to meatloaf recipe. Cooking the potatoes with the meatloaf is genius! Thanks to you and your daughter for a terrific recipe and video. Well done, ladies! Hi, thank you so much! I am so glad you loved it. 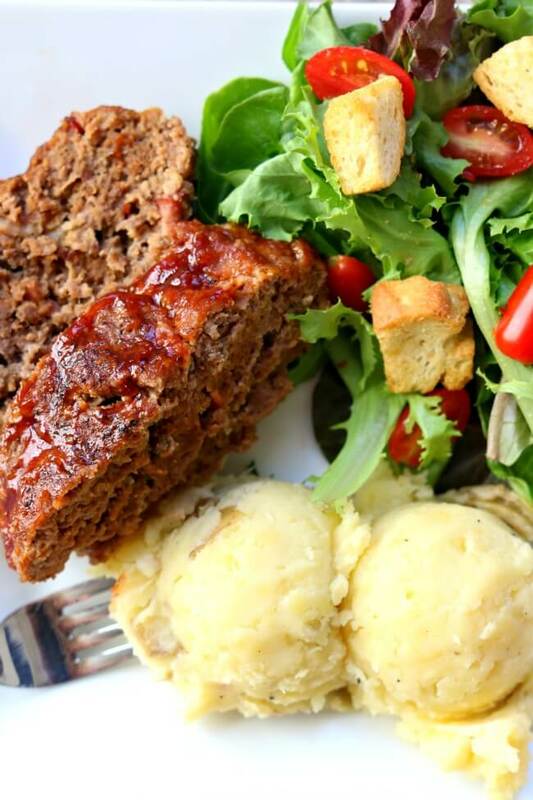 We love this meatloaf too! So I made this again, adding some finely diced/sauteed carrot, celery and onion, just so I could feel all proud of myself for eating more veggies. I won’t make that mistake again. The meatloaf went from Wow! to meh. Nope, from now on, I’m making it just as you wrote it. I’ll have my veggies on the side. Wow! good to know. I wouldn’t think that would make much of a difference!! This recipe is very Delicious! My first time using the InstantPot, and I picked your recipe since it looks so delicious. I’m glad we tried it. I doubled most of the ingredient in the recipe except the bacon. I used 2 lbs of meat (beef & pork), added onion to the meat for crunchiness, 1 tsp of paprika, panko instead of breadcrums and 7 skinny sweet potatoes. Set the time for 25 minutes … and Delicious. Thanks to Erin F for commenting to add 2 mins for 1/2 lbs of extra meat, that help a lot. I’m planning on serving this for dinner guests and don’t want to be in the kitchen too much. Can I cook this in the oven? If so, what temp & time can you suggest? I’ve never cooked it in the oven, so I’m not sure. Are you planning to cook the potatoes in the oven or just the meatloaf? Made this for supper tonight. Thanks for another great recipe. Made this tonight and it was awesome!!! The best thing I have made in my instapot so far! Everyone loved it! Can I add my praise for your recipe? Hubs and I just finished enjoying this meal, it was delicious. I did the ground turkey as that is what I had on hand. Will be in my regular rotation for meals. Your daughter’s video was so good. She is so self-confident and poised. Way to teach her the way around the kitchen while still young. Smart momma! Do you think this would be a good make ahead meal? (minus the potatoes, of course). I’m thinking of trying to make and freeze it, then cook it later?? Yes I bet that would work very well! My gas oven doesn’t have a broiler. Can anyone recommend another option to help finish the meatloaf? Can you just stick it in the oven for 5 minutes at like 425? Do you use 93% beef? Does the fat/grease drain onto the potatoes? Made this today, it was great! This was very good. I did make a couple of changes, and will make one more if I do it again, which I think I will. I put in 4 pieces of bacon instead of 6, trying to save some calories and sodium, since I have to watch both. I could not taste any bacon and neither could my husband. I think I will leave it out completely next time, and save some more in the sodium and calorie department. I don’t think 2 more pieces would have made that much difference, but maybe. I used No Salt salt substitute because I have to. I also added about a half of a diced onion because I like onion in my meatloaf. I can’t imagine that masked the bacon flavor, but if so, I’ll choose onion. I used 93% ground beef and Bullseye BBQ since it’s my favorite. I put in 2 red potatoes instead of the yukon because it’s what I had. I think your potatoes must have been very small because we had plenty of potatoes with just 2 slightly large potatoes. All those changes aside, the flavor and texture were wonderful. I made it in my Mini and still made a 1 lb meatloaf. Thank You! Thanks for your comment! It’s so fun to cook and tweak recipes as it makes sense for us and our needs! Just because they are small yellow potatoes. If they were Russets I wouldn’t put so many in. I need to change this recipe to reflect the poundage of potatoes used, don’t I? How to the potatoes not get overdone- all the mashed potato recipes I have seen says cook 8 Minutes at high pressure with QR. I don’t know but they don’t! I made again 2 days ago and the potatoes were so yummy. Wondering what you would do if you only have the 3 qt pot? Would you cut the potatoes and meat in half or leave everything as is? Thank you! This is going to be delicious. You could probably cut everything in half. Good luck! Recipe looks awesome! Making this tonite and wondering if the bacon has to be cooked prior to. Can I just chop the bacon and add it raw? What benefit does the cooked bacon add? Also, have you tried wrapping it in the bacon in the IP? Does it crisp up at all? Thanks! Hi Kristina, I’ve use both uncooked and cooked bacon. I preferred the cooked bacon because of texture. You can do uncooked if you’d like! I just found your blog when searching for recipes for my new Instant Pot that I received for Christmas. I just wanted to say that your daughter is the cutest thing! I have already watched two of her videos and look forward to trying some of your recipes. So good! Perfect amount for me and my husband, with lunch for tomorrow. Will make often. Easy and fast meal. Thank you! And I look forward to try your other recipes! So happy you enjoyed it Jeanie! This was the first real meal cooked in my new instant pot. Was so happy with the results. My husband still keeps talking about how good it was. I only made a couple changes. I did not put in the bay leaf, I added a diced onion to the mix and just mashed the potatoes the way I normally would with sour cream. I reminded me so much of the meatloaf my Mom used to make. Thanks for a great recipe. So happy to hear this Sandy!!! I have a slow cooker/crock pot…will that work? I think it could work. I haven’t tried it myself so I’m not totally sure. I would follow the instructions and cook on low for 6 hours. Let me know how it turns out! This was great! The best meatloaf I ever had. Served to a picky family of 4. They ate it all. I couldn’t believe it. I added 1/2 pound of ground pork and did 1.5 of the BBQ sauce and breadcrumbs. Kept the other ingredients the same. Also added 2 minutes of time to care for the larger meatloaf. Turned out great! So glad you liked it! The changes sound good too! Hi there! I only have an 8qt. Would I need to adjust anything to make this? Thanks! I don’t think you need to change a thing! 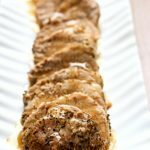 I made this recipe as my first time use of the Instant Pot. It was awesome!! I made it with half beef, half turkey. We totally loved this! I can’t wait to cook something else, thanks for such a great recipe! Super easy to make…tasteful and now a family favorite!! This will be put in rotation. Next time I’ll do 2lbs of meat. I made this tonight! My first Instant Pot meal!! It was great! I actually watched your daughters video a few times and paused as I went and that really helped! Great job! 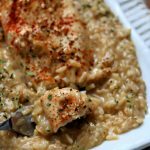 This recipe confirmed that the Instant Pot is as great as I was hoping it would be! Thank you!!! Do you live at high elevation? Did you use foil? Did you use just one pound of meat? I used 1lb of meat and foil, and don’t live at high elevation. I’m trying it out again today, so hopefully I’ll get it right this time! Could this be made without the mashed potatoes? I’m out of potatoes at the moment and only have the boxed stuff. Would it adjust the cooking time to do just the meatloaf? Thanks! yes, you can make it without the potatoes. Put a cup of water in the bottom though to bring pot to pressure. Same cooking time. Hi here…..gonna try this yummy meal. Question: Only using half the potatoes….do I still need 2 cups of water? Thanks!! you could cut the water in half. I can’t wait to make this. Thanks for the recipe! Your daughter did a great job! I used 2 cups of water with my 6 quart duo, but still go the burn message. Finally repotted to my Lux – then all was fine. What happened???? That is super weird. I’m not sure what happened! Has this every happened before? Recipe was awesome! My family loved it and we’ll be making it again. Could I ask for the nutritional info? I couldn’t find it here. Little bit of sage, and it’s perfect. Great recipe. Good call on the sage! Absolutely love this recipe! My family gobbled it up. I was worried because I oven cooked my bacon and it wasn’t crisp so I just wrapped the loaf in it. So good. Second time making. A great recipe for a busy work week. I even used small potatoes to cut down on prep time. Red bliss one time and colored medley this time. Thank you so much for sharing!! Good idea on the red potatoes! I just bought a big bag at Costco so I’ll have to try this with the red potatoes. Recipe sounds interesting; but, you need to tell your daughter that while cooking to pull her hair back into a ponytail/bun. She touched her hair at least 7 times while the video was running. Some folks see that as a reason to stop and go wash your hands again. Very possibly that her hair was clean; regardless, don’t touch your face or hands while cooking is not good. That was almost a turnoff for me. What size IP is this for? I’m afraid my 6 qt is too small. So this is more a question … I kept adding all the ingredients to the meatloaf … including the milk, butter & sour cream … stupid move on my part …😫 … I’m going with it and praying it’s edible! Do you think it’s ruined?? Yikes!! What happened? How did it turn out? Does the instant pot come with a trivet or do I buy that separately? both of mine came with trivets! Would it be okay if I used a glass or metal pan that fit inside my insta pot instead of foil since I will set in on the wire rack on top of the potatoes? This was fantastic! I used this as my first instant pot recipe since meatloaf and potatoes are pretty forgiving and can just go in the oven / on the stove if I break the IP. It was wonderful! I meal prep so I actually was able to fit 3 lbs of meat (two of which was turkey – still came out super moist) and enough potatoes in the pot no problem! Like you said, it did take a while to get pressure, but all in all I had 8 meals done in an hour, to include prep and unpackaging the IP. 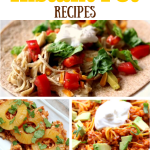 All in all, great recipe for newbies to try out the IP and a wonderful recipe! Looking forward to testing out some more of your recipes this weekend. This recipe was pure genius! It was so easy and quick to make the entree and side at once, in 20 minutes. I made it tonight for my hubby’s BD. He loves meatloaf. It was so good and the mashed potatoes was some of the best I’ve ever had. (I used 3 T. of half and half instead 1/4 C milk.) Thanks for the recipe and I hope to find more easy double recipes like this. If I were to use sweet potatoes versus regular white potatoes, do you think the cook time would be different? This was terrific! I used ground turkey for my first attempt; it was great! I think beef would be firmer, but still fantastic. I substituted A-1 for the Worchestershire (because I realized too late that I was out). I would highly recommend this recipe. oh I love A1! I bet it was fantastic. I’m about to make this recipe and only have russet potatoes. How many of these would I need in place of the yukons? They’re average sized baked potatoes. This recipe now beats out my old microwave meatloaf recipe, because it’s much more moist and flavorful. That my starch cooks at the same time is a bonus. I could eat the mashed potatoes all by themselves, too. So good! I’m so glad Gigi! Thanks for your nice comment. My meat loaf had a bunch of juice in the bottom of the foil. I just put the bbq sauce on and put in to broil. I don’t know if I should have drained it or not. I guess iI will see how it goes! hope it came out okay! This is THE BEST meatloaf my entire family has ever had. Juicy, tender, flavorful. Amazing. Tastes even better the next day as a sandwich on toasted bread! My picky 9 year old requests it at least once a weeK. I am as a little worried that the BBQ sauce would be overpowering, but it creates the best flavor!!!! I did add diced onions before cooking as well as chopped the garlic for the potatoes instead of leaving it whole. Don’t skip the broiler step. Try it. You won’t regret it. so so so happy to hear this! Very good, however my meatloaf was not cooked through. I only used 1lb, and followed the recipe exactly. I had to finish in the oven for 10 min. Will make again, however will adjust the cooking time slightly. I don’t think so. It should be the same amount of time. The recipe calls for sour cream but I never saw her use any. I’m assuming it’s for the potatoes during mashing? yep,I add it in when I’m mashing the potatoes. Amazing!. Was worried about the meat not being done all the way, but it was the best tasting and most juicy meatloaf I have ever had. My husband are almost 1/2 in one sitting. He couldn’t get enough and asked for it a week later. Also makes a great meatloaf sandwich the next day. Hi! I just want to make the meatloaf. What would I need to change to make it work? I’m new to the instapot crazw. Thanks! I would put a cup of water in the bottom of the pot. Then place a trivet in the bottom. Then make the meatloaf as stated above and place it in the foil. Place the foil on top of the trivet and cook as stated in the recipe. Good luck! That is what I did, and it turned out fantastic! I will definitely do again! And your daughter was awesome! Made for today’s dinner. It was enjoyed by all. Thank you. Reagan is awesome!! Good job, Mom! She is a natural for her own cooking show! I’m gonna have to try the Bacon MeatLoaf & Mashed Potatoes! yes it comes with the Instant Pot! I got the crock pot brand 6 ft. There’s a trivet in there but no handles. Do i just rest it on the potatoes? Mine didn’t come with a trivet … Any options to have this tonight … I’ve got one ordered from amazon. I’m sorry I didn’t respond sooner. You must have your trivet by now? I think it depends on which IP you get – our does not have one, and I didn’t know that before planning on having this as our first recipe cooked in our Christmas present. I also didn’t have a scale to measure out a pound of gb, so not sure how much meat I used but the loaf did NOT cook in the time set. Wah! So sad. I’m sorry to hear that. I like my digital kitchen scale to measure out my ingredients. They are fairly inexpensive too. Just pour the water and potatoes into a colander in the sink. You’ll want to get all the water off of the potatoes. Then put the potatoes back into the instant pot. You can use stock to cook potatoes in and mash it right into the potatoes. No need to drain. This recipe defines exactly why I love my Instapot! What a great recipe – made it the other night and it was so easy and delicious. Thank you! Meat loaf was kinda soft, what did I do wrong ? Had a great taste. did you broil in the oven afterwards? that should help! Yummo! But I used 2 pounds of lean meat instead of one left the season as is didn’t double up. Did you increase cooking time for 2 pounds of meat? It will probably be good with just 20 minutes for 2 lbs or meat…it will just take longer to build pressure. Hi! Could I use russet potatoes instead of yukons since I already have them? Would the cooking time be the same or altered? I have four rather large russets so I don’t want them to go to waste. Russets would probably take a few more minutes to cook. So you may have to take out the meatloaf and then pressure cook the potatoes for a few extra minutes. I’m not sure on the exact times since I haven’t tried it yet. I used 6 small russets, peeled and halved. But I also cooked the meatloaf for 25 minutes (5 minutes longer because I had 1.3 lbs of ground beef). The potatoes turned out great, some of the best tasting mashed potatoes, in fact. Wow, great idea! I can’t wait to try this as I definitely don’t like to use the oven during the summer. I love the fact that you include a reminder to set the valve to sealing! I am pretty new to this instant pot cooking (and loving it! ), but I’ve messed up a couple of times – and both times it was because I forgot to check that the valve was set correctly. Luckily I caught it before the pot went dry – but it could have been an epic fail – and pizza for dinner those nights! 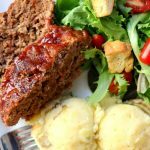 The meatloaf looks delicious and it is a great bonus that the potatoes and the meatloaf cook at the time time – I will be trying this later this week. Thanks for the great resource and all the interesting recipes. Haha! It’s a bummer when I forget to change the valve to sealing so I try to include it in the instructions so people won’t forget! Love this recipe. I did 2 lbs. ground beef and did it 24 minutes..Perfect. Thank You. Awesome Shirley. Thanks for sharing!